Get a powerful way of attracting new customers or advertising specials without spending your entire advertising budget. 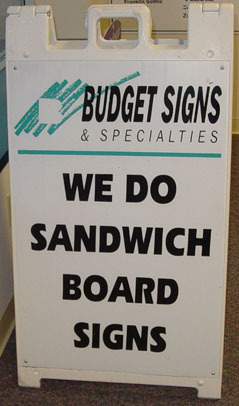 Sandwich board signs are cost effective and provide a big impact for a lot less than regular advertising. Easy to take in and out everyday, sandwich board signs allow you to change your message and get maximum impact. Call for details!